Southern Tuscany is home to a handful of wineries, which are often described as wine cathedrals. 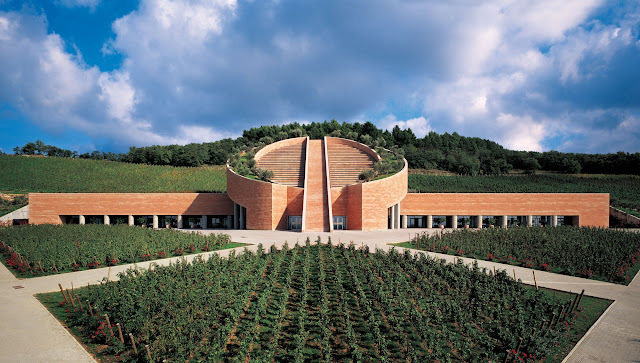 The Petra vineyard near Suvereto (by architect Mario Botta) is an interesting example of this new approach in winery architecture. At Petra the world-class architect went beyond designing an impressive wine cellar, but also included the outlay of the vineyards in his aim to form a contemporary agricultural landscape. If it is true that the way to good wine starts in the he vineyard, it is also true that only the quality of the cork, the design of the label, and the beauty of the bottle shape will bring the consumer's experience to full circle. Taking this thought further it's obvious that the birthplace of a good or even fantastic wine, is yes the vine and its grapes, but also the winery building in particular and the whole estate in general. If you know any of Botta's works, you'll recognize his handwriting immediately when walking towards the main building of the Petra winery. The materials, the colors, the cylindrical form present in many of his projects (e.g. the San Francisco museum of modern art), the trees on the roof (see his cathedral of Evry), and last but not the meticulous attention Botta pays to minute detail (he probably would have made a good winemaker too). Vittorio and Francesca Moretti (the father and daughter team behind the Petra winery) where largely involved in architect Mario Botta's project. It was clear from the start that the winery was going to be built with the prefab building parts the Moretti family had made their success with. Also an idea of Vittorio Moretti was the long, slightly theatrical tunnel dug into the hill, serving as a natural wine cellar lined up with barriques. 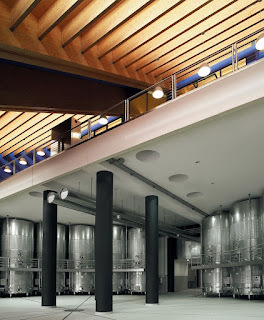 Wineries are ideal objects to turn into modern temples, however they are above all one thing, work spaces. A building that just invites the visiting tourist to reflection and contemplation won't do. Most of all the outlay of the building has to ensure best grape practices (e.g. gravity-flow instead of pumping) and simplify the working routine of the winery staff. 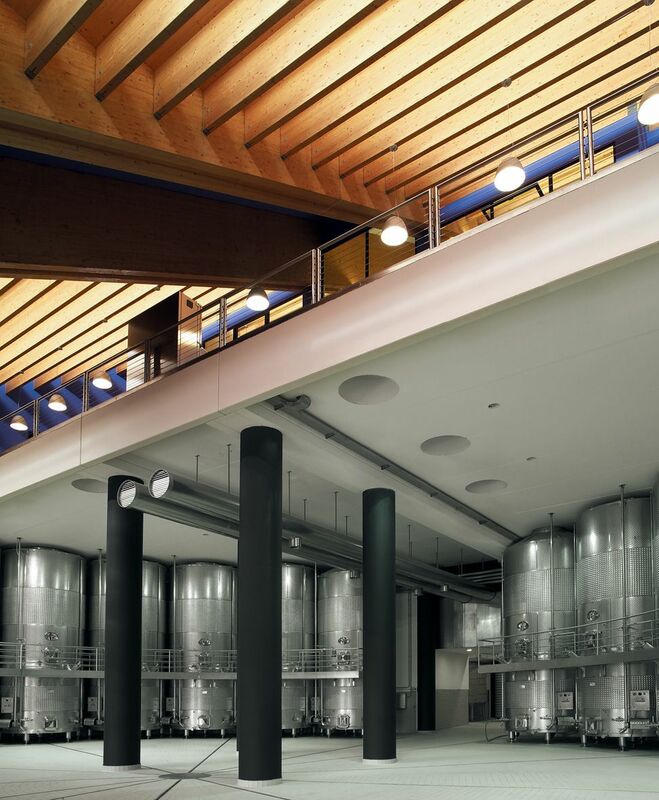 However, there is also a spiritual aspect to wine (in every sense of the word), and Mario Botta's design of the Petra winery reflects this beautifully. Petra may have been the architect's first design for a winery, but he made up for it with his ample experience in designing ecclesial buildings. After all that architecture - what about the wines? Interestingly the tasting doesn't take place in the part of the winery built by Mario Botta, but in a typical Tuscan farmhouse a short walk from the main building. 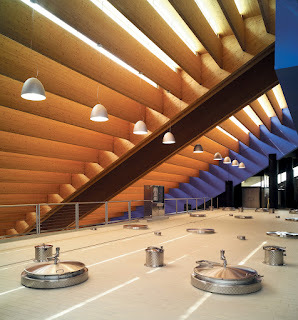 Personally, I would have preferred to find a tasting room in Botta's beautiful building. However, the traditional tasting room in the carefully restored Tuscan farmhouse and the lovely little church next to it are definitely marking a strong connection to the past. The Petra winery has four flag ship wines, all of them refined in French oak and three o them dedicated to just one grape variety each: Alto made up of 100% Sangiovese grapes follows in the footsteps of Tuscany's most traditional mono-cultivars Rosso and Brunello di Montalcino; Quercegobbe (100% Merlot) and Potenti (100% Cabernet Sauvignon) are unusual but interesting examples of the more recent Super Tuscan wine culture. An exemption to the one-variety-a-bottle rule is the wine, that carries the name of the estate: Petra, a blend of Cabernet Sauvignon and Merlot grapes. Reflected in the wine labels are the round shapes of Botta's architecture. Whereas, in the case of Petra's Mareto wine - a blend of Merlot, Syrah and Malbec - the label pictures the prefab parts of the Moretti holding used in the construction of the barricaia (the cellar dedicated to barriques). Wine cathedrals have their price. Talking Tuscan wines, the young Petra winery is definitely located at the higher end of the scale (direct sale around 28 Euro per bottle for the mono variety wines). In case you travel on a shoestring, access the Val di Cornia DOC wines via Petra's easy to drink Zingari; the name means "gypsies", maybe a hint to the several grape types involved in the blend (Merlot, Sangiovese, Syrah and Petit Verdot). Tastings and winery visits available on most days of the years (also on Sundays and most public holidays), but be sure to book in advance. Want to see more Botta in Tuscany? Drive southward and visit Niki de Saint-Phalle's Tarot Garden. The beautiful entree hall to the colorful sculpture garden was designed by the Swiss architect too. For more architectural adventures nearby, move on to the Tuscan coast and have a great meal at restaurant Il Bucaniere right on the beach of San Vincenzo (designed by Italian star architect Massimiliano Fuksas).